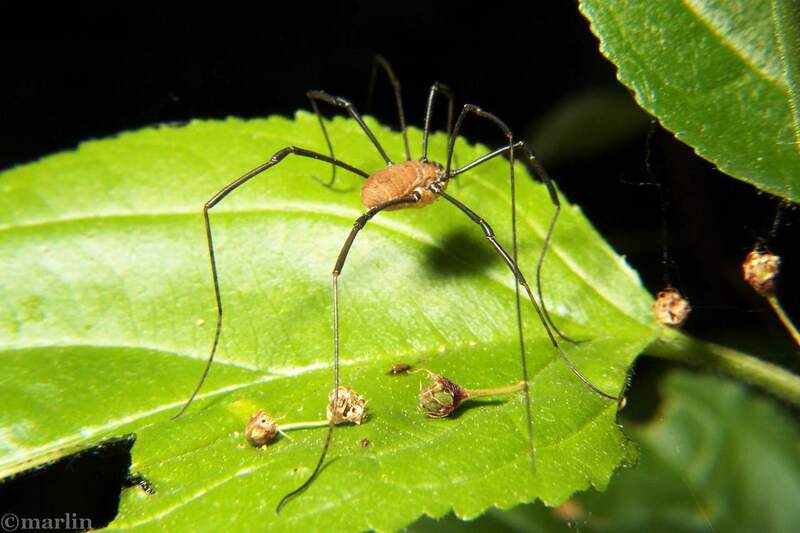 When I was a child, we called these creatures “daddy longlegs spiders.” But they are not spiders at all – they inhabit their own order, the Opiliones. There are, indeed, true spiders (order Araneae) that are called “daddy longlegs”, but those are spiders of the family Pholcidae, aka cellar spiders or vibrating spiders. The Pholcidae are venomous, the harvestmen are not. The turret-like knob on top has a primitive, simple eye on either side. The red blobs are parasitic mites. 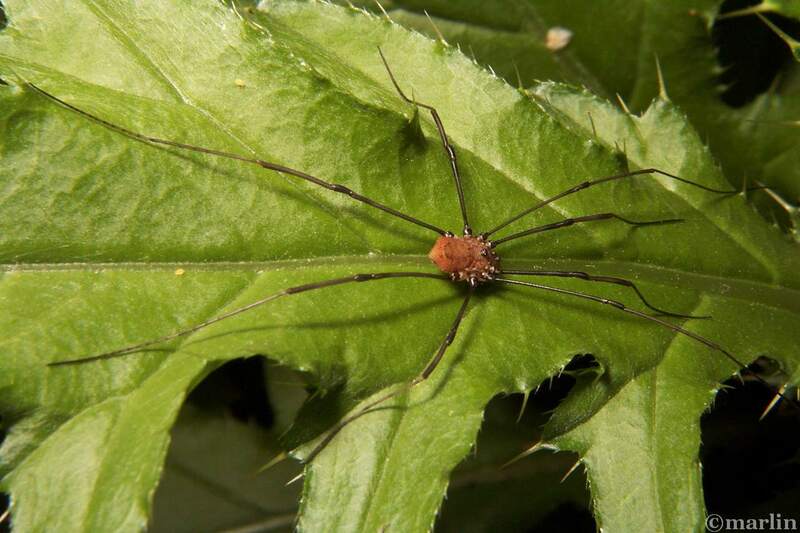 Unlike the spiders (order Araneae), the abdomen of the harvestman is divided into segments, but it has no “waist”. Instead, the head, thorax and abdomen are grown together into a compact, oblong body. They do not spin webs, or use silk or build nests. On top of the head is a black “turret”, a knob with a tiny eye on each side. I know from watching their evasive actions they can detect me moving from 6 feet away. 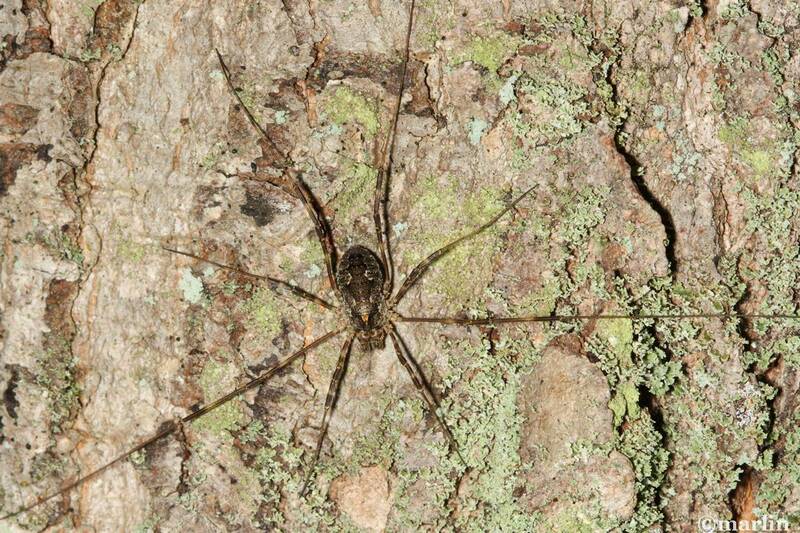 About 1,900 species of harvestmen are distributed over the world in forests, fields and other land habitats. They can and do walk on water. We have 60 or more species in North America and the adults of all but one of these die with the coming of winter. They mate in late summer and autumn. While the smaller male drives away rivals, the female lays a few eggs at a time in the soil, or in or under rotten wood. This is repeated until she becomes merely an empty shell. In spring the newly-hatched young are white miniature editions of the adults. They soon darken and, as they grow, shed their skins like many insects do. 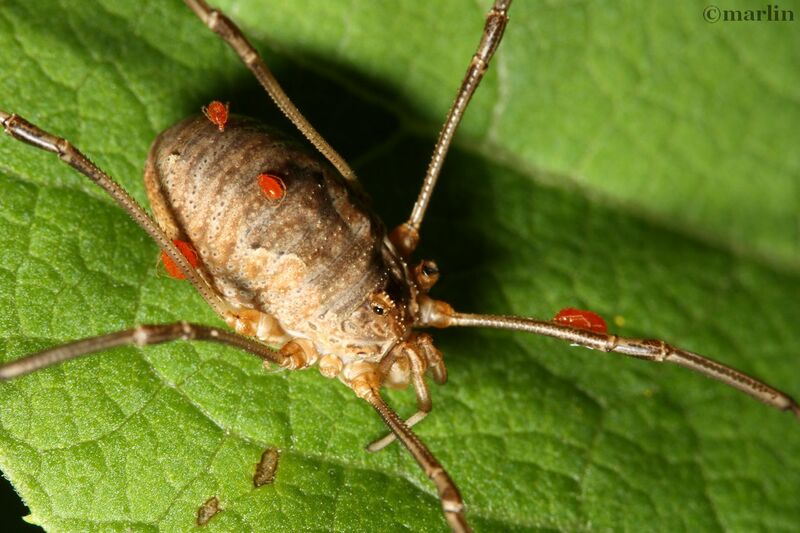 Harvestmen are omnivorous, and thrive on decaying organic matter of every variety. I found this very well camouflaged harvestman Odellius pictus out and about in deep twilight. When I shined my light on it, it assumed this pose, making itself look like an orbweaver spider in a defensive crouch. The banded markings on the legs add to the illusion – most orbweavers sport nearly identical markings. This sort of mimickry is common in the arthropod world; benign creatures are trying to look dangerous – in this case, implying a venom-delivery system. 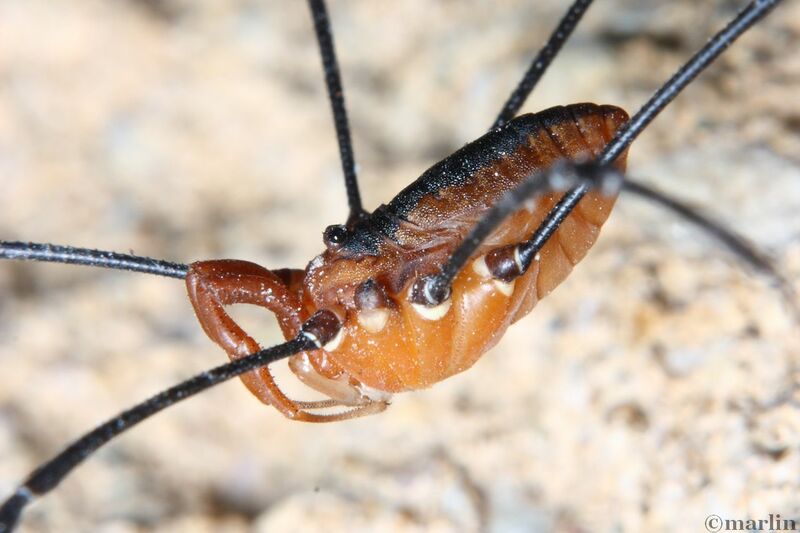 At the front are a pair of pedipalps, pincers used to grasp, tear and stuff food into its mouth, to fight other harvestmen, and to frequently clean its legs. Those seven-jointed legs are unique. If we had legs in proportion they would be 40 feet long. The second pair is the longest and their sensitive tips are used to explore, search for food, and warn of danger. The fourth pair is next in length and the first pair is shortest, and supposedly they can all be regenerated if lost or damaged; although I so frequently see these guys missing one or more legs, I have to wonder, “How long do these things live, they have time to grow new legs?” Besides, they seem to get around fine with six or seven.